1940s hats were both a continuation of the popular styles of the 1930s and new additions to the casual headwear in the form of the beret, turban, headscarf and snood. Women’s hats in the 1940s were a diverse collection of styles largely pulled from different times in history. To list them all would be one monumental task. Instead I pulled together over 20 of the most common styles for the average American woman. First a little 1940s hat history. While 1940s hats were not rationed during war time they were heavily taxed at 33% as a luxury purchase. Good materials were scarce so many milliners turned to unusual decoration materials and recycling upholstery fabrics. In Paris they grew larger and more outlandish, making some authorities question their patriotism. For most civilians, going without a hat was more common, especially for sporting and leisure activities as well as evening parties. A nice hairstyle did not need to be covered up by a large hat. Berets, small doll hats, and turbans were simple, easy no-frills hats to be worn for any occasion. Many hat styles remained from the 1930s but with a less ornamented, slightly more masculine style: snood, flat boaters, upturn sailors, pancake beret, knit turban, cartwheel, tricorn, toque, pompadour, doll’s hat, fedora, bonnet and bowler. Instead of an elastic chin strap to hold them in place at odd angles, hats now had rubber combs, clips or bobby pins attach them to the hair. Newer small hat styles were chaplets or curvettes adored with small flowers, ribbons, sequins and partial veils. What was lacking was the use of exotic feathers. By 1941 an agreement was reached between the National Audubon Society and Feathers Industries of America, Inc to ban the use of wild bird feathers in millinery. Instead, barn yard plumage was dyed and styled to look exotic. Most trim was made of fabric, velvet ribbon and costume jewels with only one small feather added to the mix. Simplicity in materials was the way of the ’40s hat. The beret hat was borrowed from military dress. It was a pancake flat, round, felt hat perched on a narrow band. It sat flat on the head or at a slight angle. The beret shape created many styles of hats in both felt and straw for high and low fashion. Common colors were blue, green. brown, and red. To add a little sparkle, brooches were sometimes clipped to the beret. The Tam, short for Tam O’ Shanter, was an old style revived in the 1940s. It looked similar to the beret in that is was also made of felt, round and mostly flat. The Tam brim was usually wider and taller then the Beret. A bow or other simple adornment often topped the crown. The pillbox hat was also worn during the latter half of the ’40s. It was part of the new look, a style that was refined and elegant in its understatement. It was stiff and round and usually undecorated except for a possible net veil in front that covered the eyes. It was worn either on top of the head or on an angle on the side. Hatpins would hold the hat in place. The pillbox could be worn with anything, from daywear to evening, with dressier styles and more elaborate decorations. It became an icon of the 1950s. The Turban came into style starting in 1936 and were considered the hat style of fashionable American women in 1940 according to Vogue. It was a style that could be high fashion or low fashion depending on materials and decorations. At its simplest it was a long piece of fabric knotted at the forehead and tucked back under to form a wide bow. At work it kept hair out of the face, at home it hid pin curls being set. In Europe, night raids often created a lack of water for days or weeks. The turban covered up dirty hair fashionable. Turbans were made from a variety of materials, depending on their use, and came in a rainbow of colors. For workwear, cotton or rayon was the material of choice. Rayon was also used for causal turbans, and fancy ones were made from rayon velvet. More elegant styles also featured bows on the top. Turbans came in black, navy blue, white and beige. Miniature hats, toy hats, doll hats, half hats, fascinator and small saucer hats were exceedingly popular in the ’40s. Some had brims, some didn’t, some were simple some were fancy. These were made from fabric, felt, straw or velvet and sometimes were piled high with with feathers, ribbons, bows, fruits, flowers and beads. Some featured a net veil in the front that covered the eyes, sometimes the entire face. The hats were pinned on with hatpins, and were often worn at a jaunty, fun angle. For many women, a hat wasn’t anything more than a piece of netting with a velvet bow or flower clipped to one side. This is what my lower middle class great grandmother wore whenever she needed to dress up. Shopping at vintage shops today often results in finding a plethora of these simple small hats. Large Victorian picture hats reappeared in the mid ’40s and went by the name Cartwheel hat. Usually they were a straw summer hat with over sized stiff brims that were practical and fashionable. The width balanced out the new slimmer silhouette of the late ’40s. The 1940s version lacked much decoration- maybe a long ribbon and bow tied around the crown. The 1950s version featured a plethora of feathers, flowers and jewels. Straw imported from Italy ceased in 1940 so milliners turned to using cheaper raffia or starched cotton lace. In the fall many wide brimmed hats came in traditional felt or velvet with a smaller but still large size brim. Sailor and skimmer hat names were used interchangeably. In summer they were made of braided straw and formed a wide flat brim with shallow circle crown. The usual wide ribbons, bows, feathers and veils added interest to these sun hats. In the winter the shape remained but the materials turned to felt or velvet. Suiter hats looked like Victorian riding hats or men’s top hats with distinctive curled side brims and tall crown with flat top. They sat perched on top of the head and slightly forward onto the forehead. A ribbon band, large bows, tall feather(s) and veils added more drama. Another style borrowed from the Victorian era is the bonnet hat. With a semi deep crown fitted at the center back of the head and a brim that enclosed around the side and forehead, the bonnet was a charming feminine design. It came with a ribbon band and flower clusters just like generations past but lacked a chin strap. Similar to the bonnet and also borrowed from the recent past, the 1940s cloche hat was worn on the back crown with narrow brim. Its oval crown was much tighter and brim smaller than the bonnet. It was a youthful, dainty hat that was adopted most by girls and teens. Another popular teenager hat was the Derby. With very round/oval crown and tightly rolled brim all around it was worn with a ribbon band and tall feather on one side. It was a style borrowed from late teen and early ‘20s men’s hats. The fedora hat and homburg hats were two other styles borrow from men’s hats. In the 1940s men were wearing both hat styles. The women’s version featured wider brims, softer shaped crowns and larger bows or feathers. Hats that were brimless went by the name Calot hat. It fit onto the back of the head with combs and bobby pins to hold it in place. It was an ideal hat to wear with freshly styled hair that a woman would not want to cover up. What it lacked for a brim it made up for in large flowers, big bows, and ornate applique designs. It was best viewed from behind. The chaplets or curvettes were two other styles of brimless hats that sat on top of the head. Pictured left, this curvette was adorned with large flowers and netting to the back on a base of woven raffia in the shape of a crescent. In many ways they acted like a headband. They were more popular with young teens but fancier versions with sequins were seen in the evenings on mature women. The opposite of the tight fitting calot or cloche was the pompadour hat. 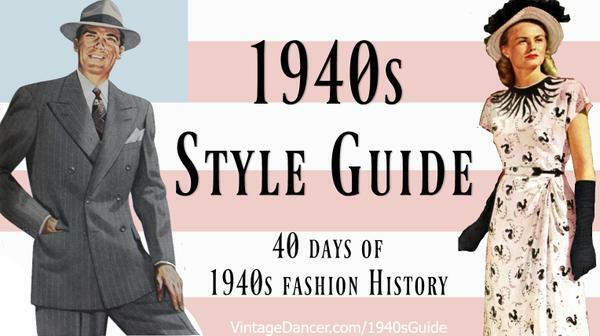 Just like the pompadour hairstyle, the 1940s hat had most of its volume on the top and on the forward part of the head. A pompadour hat could embrace many other styles of hats as well such as the pompadour roller, pompadour scottie or pompadour beret. The names of 1940s hats continue. More style, more choices, and more blending of two or more styles to create another. Here are few other popular styles. Scottie Hat- Like a Men’s Sailor hat. Old fashioned head coverings returned in the 1940s. They did well to cover up messy or dirty hair, keep hair out of the face and provide warmth in winter. Scarves and snoods accomplished these with beauty. Snoods, a knit or crochet hair net were common during work or home life. Fancy snoods had small flowers and bow knots tied into the netting giving them a medieval vibe. The kerchief style of head scarf was revived from the Victorian era with names Capote or Babusha. It was a triangle scarf simply tied under the chin but later moved to under the back of the hair and finally up onto of the head- a la Rosie the Riveter style. Some kerchiefs had attached long tail scarves for winter that wrapped around the neck and draped down the back. Scarves were made of silk, rayon, cotton, wool and hand knit yarn. Some also had tassels or fringe on the edges. Most scarves featured a floral print reminiscent of Spanish ladies, like Carmen Miranda. Head scarves with travel motifs were popular souvenirs from vacation destinations. Another hatless trend was to wear only flowers in the hair. Single large flowers or cluster of small flowers with leaves brought the beauty of nature home. Hair flowers exposed a newly styled hair-do. With a matching brooch they elevated a semi formal dress. Today hair flowers are very popular with the 1940s pinup look. Flower types included the white gardenia, clusters of daises, baby asters, roses, rose buds, and narcissus. Feathers too were died and curled. Bows were made of velvet, acetate rayon (sheer but stiff) and came in red, blue, kelly green, black, white, royal blue and copen blue (a medium blue.) Bow clips were more common with teens and young girls. Women would wear bows too but they were larger or an abstract design. 1940s hats are still somewhat easy to find in vintage and antique shops. They may not be the fancier versions but a simple base is common as well as a great starting point to add your own decorations. I also like to look for new hats in classic vintage shapes and add decorations. Hair flowers and bows I prefer to buy new. There are far to many crafty women who make and sell their flowers on online to choose from. Love the collection and the detailed history that goes along with it. Thanks for sharing. LOVE this *hat place! I am a designer and the hat references are very helpful. Thank you!